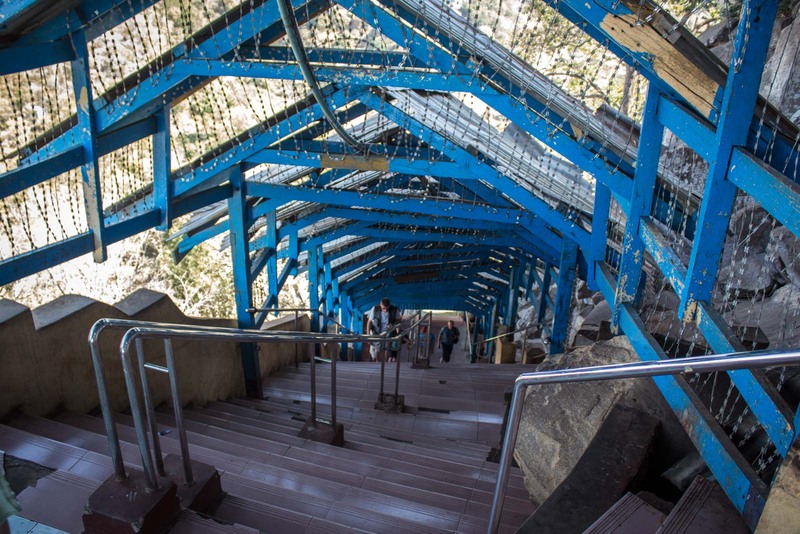 You feel every one of the 777 steps climbing to the top of the monastery at Mount Popa. Partly because of the burn in your legs. Party because of the constant threat of attack from the hundreds of monkeys who live along the staircase, seemingly guarding it, army-like, from any enemy invasion. 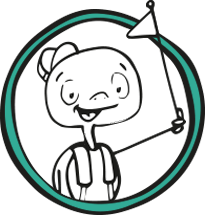 In lieu of any enemies, they make food in your bags or pockets their target. 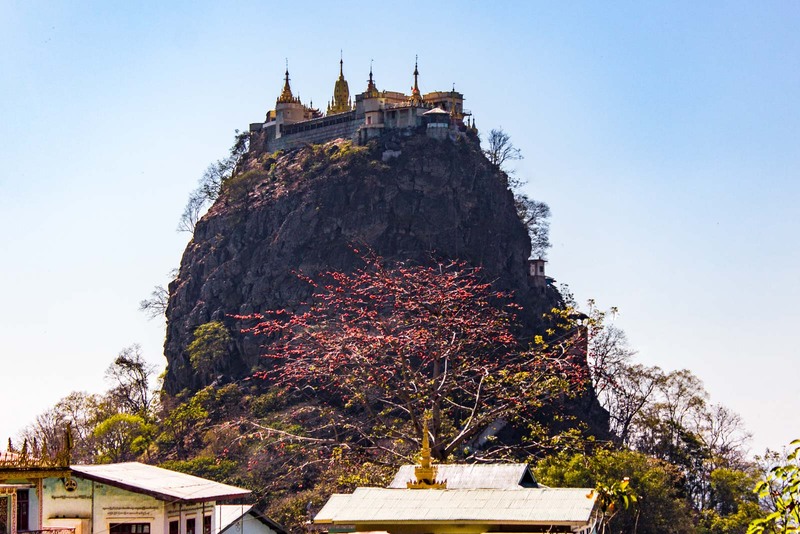 The monastery is built on the top of a volcanic plug, caused by the nearby volcano Mount Popa. It rises 737 metres above sea level and stands out awkwardly on the landscape, like a lone skyscraper in a city of shacks. 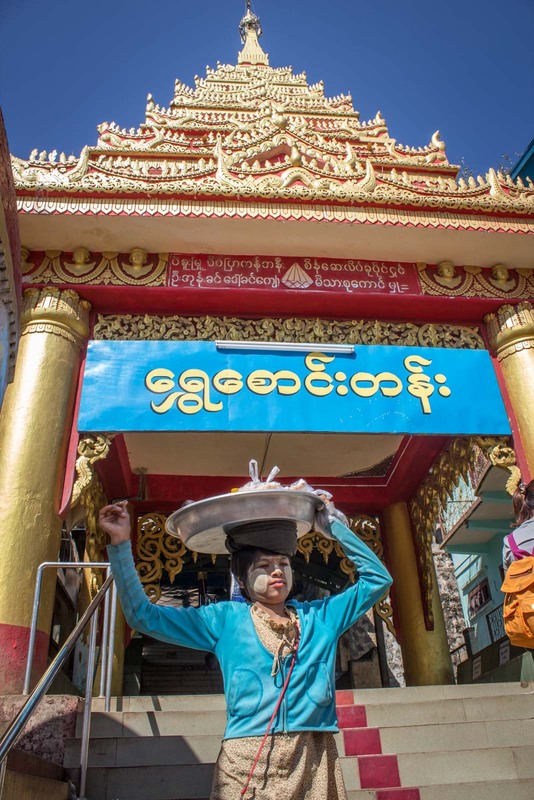 From below, the gold at the top shimmers in the Myanmar sun. Along the staircase to the top, various temples and shrines provide a chance for rest and spiritual reflection on why you’re tackling such a climb. A hermit called U Khandi maintained the staircase until he died in the 1940s. For a hermit, it wouldn’t have been a particularly solitary life, though. 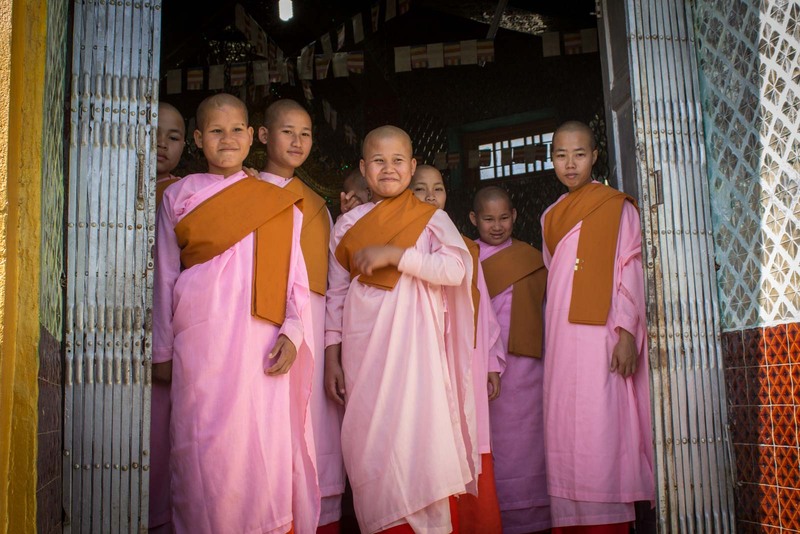 The monastery is a popular pilgrimage site for the Myanmar people. 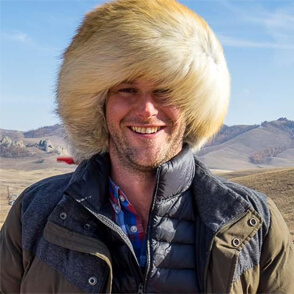 They come in a large part for the residents of the mountain. Not the monkeys… or the monks… but the spirits known as nats. There are 37 of them in residence, apparently, and are depicted in their human forms in these statues at the bottom of the staircase. 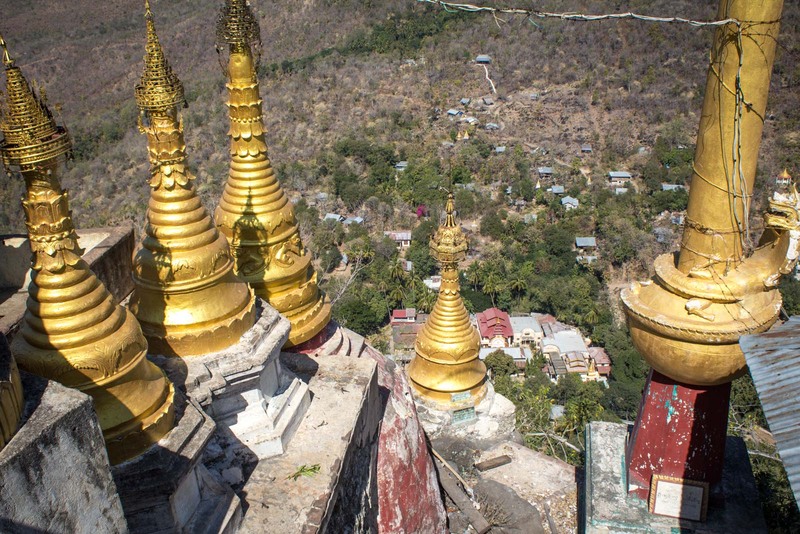 The Mount Popa monastery, or Taung Kalat as it’s technically known, is an easy day trip from Bagan. It takes just over an hour to drive there and there are plenty of people in Bagan who will gladly take you. 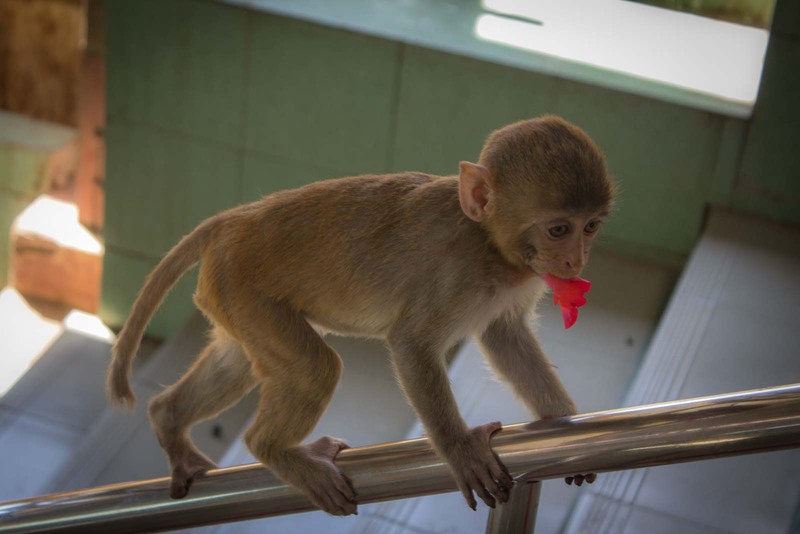 If you’re not scared of monkeys – or nats – it’s worth it. Wpw that’s impressive. To get to the top I would have not to look down. Getting down might be a problem though! 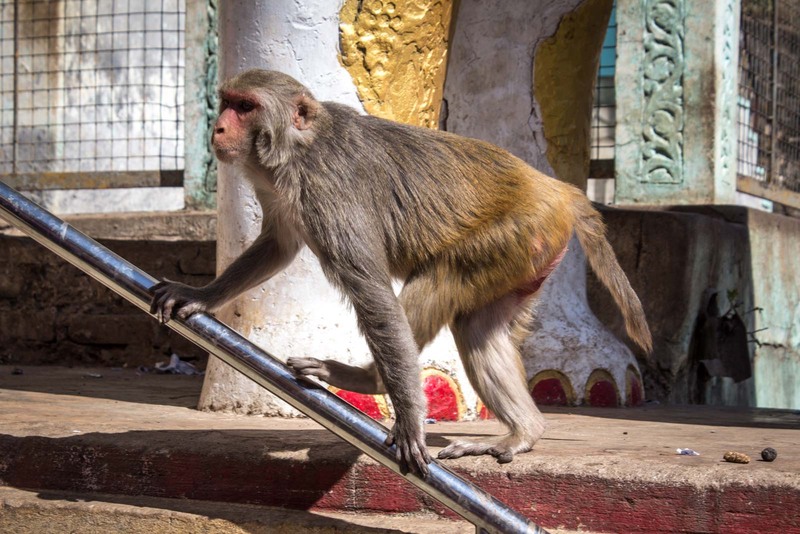 Trip to this monastery really worth, and stepping up makes it rappelling while monkey makes it rappelling adventure. Awesome place to visit. From downwards, it seems like a castle built on the top of the skyscraper. Yes, it does look like a skyscraper. And it seems even more dramatic because it’s the only one you can see from all around! Now that, is absolutely amazing, why oh why have we never seen this place before. How many more gems is Burma waiting to show us ??. 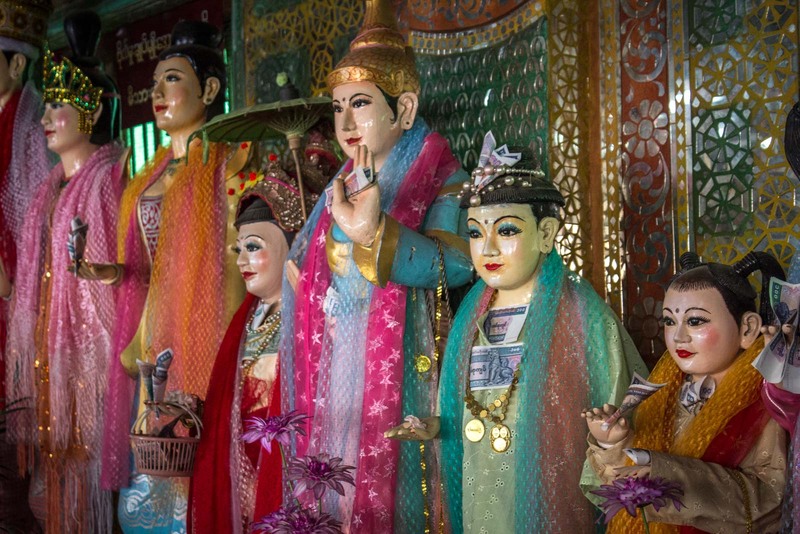 Lots more gems from Burma! 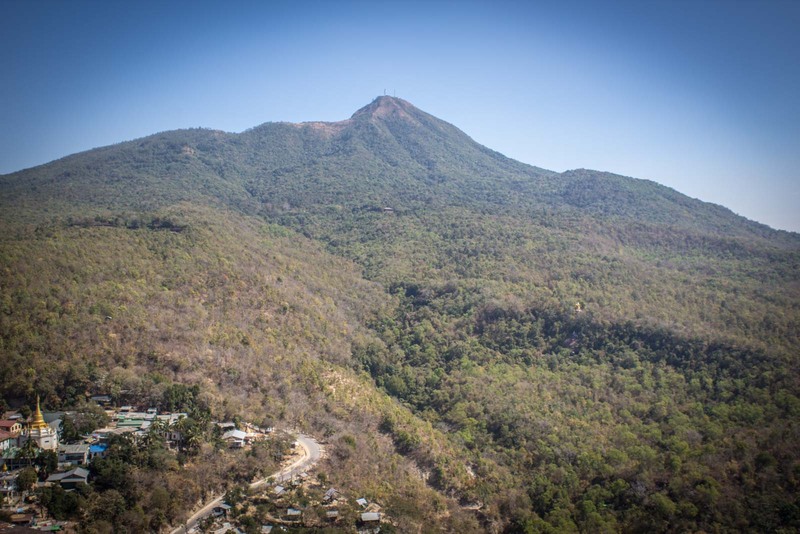 I hadn’t heard of Mount Popa either (even though it is referred to in guidebooks and stuff, I hadn’t read that bit too carefully). So it was a really pleasant surprise to get there and realise exactly what it looked like! This place really reminds me of Sigiriya in Myanmar which is a lonesome volcanic plug amid the vast plains of the island. It seems like this place is really worth a visit when I go to Bagan one day. Do you mean Sigiriya in Sri Lanka? If so. I haven’t been there myself but would love to check it out if it’s anything like this. I would put the monkeys at 11 on the scale! 🙂 No, seriously, most of them were quite well-behaved but there were a few that were so not afraid of humans that they would just jump right on you and try to go through your bag or pockets. I had to bat them away with a water bottle! Aw the little guy with the flower in his mouth is sweet! Sounds like a very interesting place, need to get myself to Burma. Yeah, they look cute until they jump on you! Still, it was a really interesting place and the monkeys just added to the experience. I like monkeys, but these seem a little intimidating. Beautiful monastery and I love the monkeys! Then you’ll love this place!! Gotta love Monkeys, my dream is to hang out with one on a beach drinking beer and being the crazy foreigner. So glad you made it there! It’s a pretty cool place, isn’t it?